Work from One Minute Sculptures. “Like Duchamp with his snow shovel, Austrian artist Erwin Wurm can make art with little more than a rubber band, a pickle or some dust. Wurm calls himself a sculptor, though many people might be more inclined to call what he does performance, and what viewers usually see are photographs or videos of these performative “sculptures,” or their related instructional drawings. With feet firmly planted in conceptual traditions of the 1960s and ’70s, Wurm riffs on those traditions with his own brand of comic conceptualism. Wurm’s One Minute Sculptures don’t always involve people. Chairs balancing on one leg or with two legs propped up on carrots, a banana suspended between sliding cabinet doors, and upended and stacked configurations of hotel furniture are all examples of Wurm’s fleeting sculptures. Though his work has taken many forms since the early ’90s, the common thread is the question of what constitutes a sculpture. Is a person sticking out his tongue a sculpture? If that particular act exists only in a photograph, is it still a sculpture? 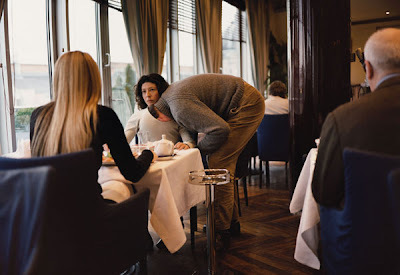 Wurm’s works share strong affinities with those by German artist Franz Erhard Walther, who in his instructional pieces similarly describes an art work as an interconnected event between a human body, an act and an object. Certain examples by Ana Mendieta, Yoko Ono, Bruce Nauman, Joseph Kosuth, Charles Ray and Dennis Oppenheim also show an undeniable kinship. Wurm continues to explore issues similar to those of 1970s Conceptual or Body art pieces that only live on in documentation. Whereas some artists are content to allow their works to linger in the realm of pure concept, Wurm encourages the implementation of his ideas. To wit, viewers participating in the One Minute Sculptures can have a Polaroid photo taken by a gallery attendant for a nominal fee. For an extra $100, they can send the photo to the artist, which he will sign and validate as an art work…” – Stephanie Cash for Art in America the whole article is here. The entry 'Erwin Wurm' was posted on November 28th, 2009 at 6:10 pm	and is filed under austrailian, direction, humor, instructables, mega-famous, meta-art, performance, sculpture. You can follow any responses to this entry through the RSS 2.0 feed. Both comments and pings are currently closed. 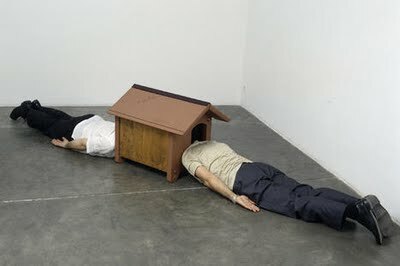 Wurm's "Do It Yourself" and "One Minute Sculpture" series would be, in my opinion, better described as performance art. The photographs above show individuals performing the instructions given to them by Wurm. 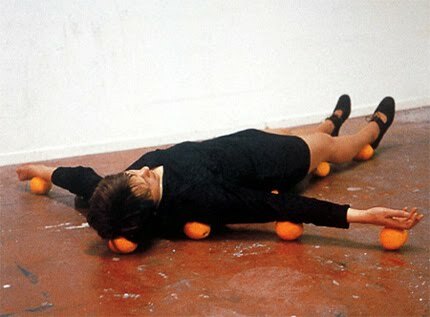 When he uses a human body to perform these acts in his self-described sculptures, it makes more sense that they be labeled performances documented through photograph rather than sculptures. It is quite a bit more understandable and appropriate that the works which actually contain objects as the main focus, rather than the human body, are referred to as sculptures.